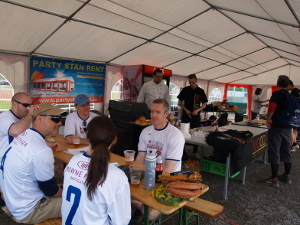 We would like to introduce and invite you to The Prague Post Heavy Hitters Softball Charity Tournament, a traditional semi-annual tourney held in Prague since 1992. The Heavy Hitters is organized by The Prague Post Endowment Fund, a local NGO aimed on supporting education in Czech Republic in cooperation with Eagles Prague. The Heavy Hitters Charity Tournament for Education is the main Prague Post Endowment Fund’s fundraising event and it has become a Prague tradition. The tournament is usually attended by 200-300 people. Participating teams pay an entrance fee and sponsoring businesses help cover the costs of hosting the event. Heavy Hitters is a coed slowpitch tournament with two divisions – sports (more competitive) and recreational (for occasional players). The 31st Heavy Hitters will be held on September 28-29, 2013 at the Eagles Prague fields in Prague, Czech Republic. PPEF welcomes teams from all over the world to participate and enrich the tournament. Early birds application deadline is September 8, 2013. If you wish to participate, visit www.ppef.cz for all necessary information (registration form, entry fee levels) or contact the PPEF at education@praguepost.com.